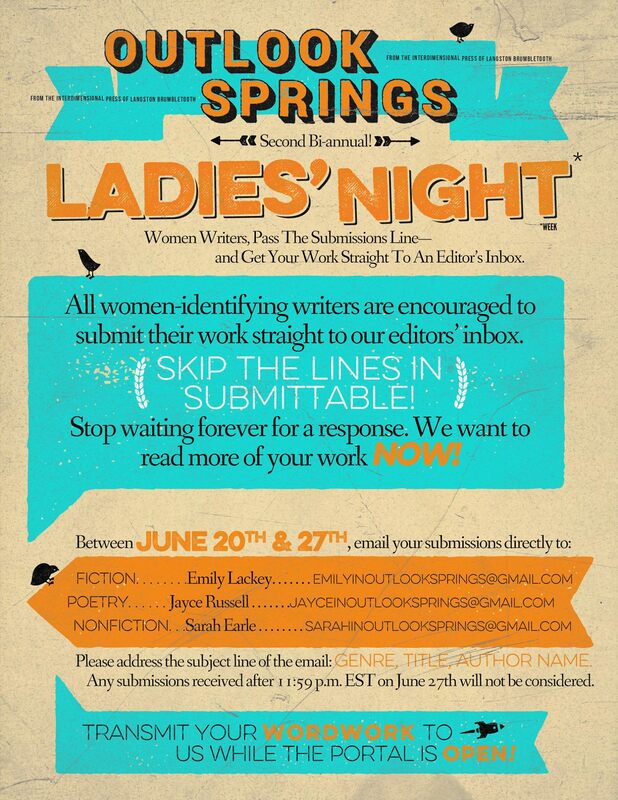 Earlier this year I interviewed Andrew Mitchell, Editor-in-Chief of Outlook Springs about their first “Ladies Night” submission call with an opportunity specifically for women poets and writers to send their work direct to the editors. The interview (updated) and submission information is below. IMPORTANT NOTE: Submit just one genre at a time (poetry, fiction, or non-fiction). Once you hear back from that genre/submission, you can submit to another. What spawned the idea for the “Ladies Night” submission call? Spearheaded by one of our brilliant editors, Emily Lackey, the Ladies Night was a result of us taking a hard look at our submissions and realizing we weren’t doing enough to reach women writers. (Almost 70% of submissions were written by men.) We wanted to be more proactive in our attempts, and so the Straight-to-An-Editor’s Email approach seemed like a great avenue. You can read Emily’s original Ladies Night blog post here. What type of work is Outlook Springs is looking for? For poetry, we have a keen interest in finding poets who haven’t found their way into larger publications. We’re excited by voice and confidence in language, by poets who know how to control propulsion and energy both visually and sonically. (Emphasis less on “what’s being said” rather than “how it’s being said.”). For fiction, we want stories in which the writer takes risks, both in narrative and in style with lots of attention to language at the sentence level. Our tastes are wide-ranging–minimalism, quiet “literary” stories, magical realism, experimental, slipstream, etc.–so long as the emphasis is on character and language rather than the cleverness of the conceit/plot. In terms of non-fiction, our concerns are very similar to fiction. Whether it’s an experimental piece or a more standard linear narrative, we want to be excited about language, character, and voice. What are some of your favorite journals? Where can writers send regular submissions? If someone has a question, how can they contact you? Andrew Mitchell lives in Dover, New Hampshire. His short stories have appeared in print or online at The Saturday Evening Post, Tin House, The Emerson Review, and elsewhere, and he was the 2014 recipient of the Thomas Williams Memorial Prize for fiction. He is the Editor-in-Chief of Outlook Springs, a magazine he founded with his friends, and you can follow him on Twitter at: @andrewrmitchell.